My boys love to listen to audiobooks and podcasts. When it's a funny book, they will listen to it over and over again, laughing uproariously each time. One of their favorite podcasts is StoryNory, and I keep it loaded on my iPod so we can listen to it on the go. Lydia, on the other hand, prefers songs. When the boys hop in the car and request StoryNory, Lydia responds with insisting on songs. We take turns, and I'm sure she'll stop yelling about it one of these days. 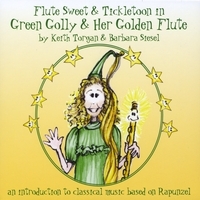 Last Wednesday, I picked up the mail on the way to pick up the boys and found the audiobook, "Green Golly & Her Golden Flute: an introduction to classical music based on Rapunzel" in my mailbox. It's a collaboration between Barbara Siesel and Keith Torgan. I popped it in after we got the boys, and I was able to assure Lydia that there was music as well as storytelling. This is a re-telling of the Rapunzel story, with some fun updates and interesting twists. Classical music pieces are interwoven throughout the story to the point where they seamlessly fit the story. Nate amazed me at one point when he said "Hey! That's Mozart!" about 20 seconds before the narrator mentioned the name and composer of the piece that was played. The CD includes the story, with pieces from Chopin, Mozart, Bizet and more skillfully played as an integral part of the story. After the story finishes, the CD includes a beautiful flute recital (with piano accompaniment) of all the pieces in greater length that were performed during the narration. For a few years, we regularly attended the Phoenix Symphony children's concerts. It wasn't in our budget this year, but this CD reminded me of the types of concerts put on for the children's concerts. I hope we are able to renew our season's tickets next year, as we missed the live music performances this year. Everyone (even Lydia!) enjoyed this CD and would happily listen to it again. Nate asked if he could have it on his mp3 player so he could listen to "all the beautiful music over and over." Colin said that he found the story funny, and wondered if there were more stories about the traveling gypsy. I'm excited that I can share a copy with one of my readers! Just enter the necessary information on the giveaway form, and you'll be entered to win. Mandatory Question: What is your favorite type of music? Extra entries if you share this post on Twitter and/ or Facebook! Extra entry if you follow my blog blog via RSS, Bloglines, Google Reader, Networked Blogs, etc! Giveaway ends Wednesday, April 19, 2010. Winners will be notified via email and I'll ask for your address so your CD can be mailed to you directly. Giveaway Page Link removed when giveaway ended. Disclosure: I received a copy of the CD, and one was provided for the giveaway. Happy Easter, Melanie and family!